1. Taken as a whole, the readings offer a picture of the various considerations that must be accounted for when working on gender equity policies: federal versus local adoption and leadership; the effects of funding frameworks; the internal logics that structure equity policies and their outcomes; and so on. When you consider these readings together, what do they teach you about gender mainstreaming and intersectional analysis? This week’s class revisits the how of making cities more inclusive. How is inclusion modeled, practiced, and institutionalized in policy frameworks? To what end? What are the effects of such policies? The readings present us with several ways to think through these questions. Alston (2009) approaches gender mainstreaming through the United Nations, the Council of Europe, and the international women’s conferences in Mexico City (1975) and Beijing (1995). She explains that the purpose of gender mainstreaming is to “address gender equality and to ensure that women are not further disadvantaged by gender blind policies that perpetuate inherent male advantage” (p. 141). She then details how policy recommendations have shifted to address gender inequalities: gender mainstreaming, according to Alston’s description, was a shift away from the women-focused policies that emerged during the Mexico City conference toward attention to the inherently “gendered arrangements” of organizations. Drawing from Teresa Rees’ work, Alston states that the internal logics of organizations – their “priorities, processes, structures and strategies” – are interrogated with an eye toward amending existing gender bias (p. 141). The idea, notes Alston, is to change existing systems rather than modifying women’s behaviours in order to fit into existing systems. Likewise, Anita Lacey and her colleagues (2012) (not part of the assigned readings) highlight the origins of gender mainstreaming as it relates to inclusive cities. 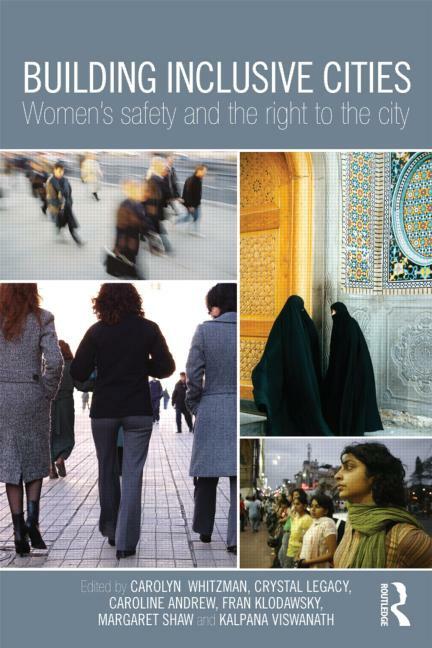 In a chapter of the recently published Building Inclusive Cities: Women’s safety and the right to the city (Whitzman et al, 2012, Routledge), Lacey et al write that there were two separate but interrelated arenas of activism and scholarship that spurred the development of gender as a primary, exclusive (and, implicitly, unitary) lens to examine the “oppression and exclusion of women from city life and public spaces” (p. 144). These arenas were those that focused on a) violence against women and b) women’s safety. As this work evolved, they argue, “the focus on women-specific policies and programme strategies…began to shift towards a more comprehensive analysis of gendered power relations and rights” (p. 145). Moreover, the adoption of gender mainstreaming by the UN in 1997 has encouraged governments at all levels (municipal, provincial, federal) and NGOs (non-governmental organizations) to adopt an explicit gender mainstreaming approach to address concerns of gender equity. Gender impact assessments (GIA), gender budgeting, and safety audits are among the strategies that planners and policymakers have adopted to apply gender mainstreaming principles on the ground (p. 146). We will look at examples of these strategies in class. While gender mainstreaming was envisaged to be a transformative approach to policy design and institutional analysis, both texts emphasize the drawbacks that hamper the effectiveness of gender mainstreaming policies. For example, Alston notes that there is a basic lack of understanding about gender equity among agricultural policymakers in Australia, which is unsurprising in a neoconservative political environment marked by cuts to social policy, including women’s units. Specifically, she writes, “the problem for Australian women is that the actors normally engaged in agricultural policy making do not readily understand gender equity in the context of agricultural production” (p. 141). Despite the fact that gender mainstreaming emerged precisely to confront the normative expectations at work in policy development, then, those who debate, write, and enact policy do not question the assumptions at work, and are not encouraged or required to consider gender equity as relevant. For Alston, this relates to leadership and governmental support (and political will more generally) for gender equity, as well as a cultural context in which social norms are less open to change. Thus, Alston’s assessment suggests that “gender blind” would be a better characterization of Australian agricultural policy, where gender blind implies a lack of insight into the differential impacts and experiences of both drought and agricultural policy on women and men. In contrast, Lacey et al contend that gender mainstreaming is often critiqued for its implicit treatment of women and men as homogeneous groups (p. 148), where differences within “women” and “men” are obfuscated for the benefit of facile policy design. This critique is precisely addressed by the Ottawa Gender Equality Lens, which offers specific questions aimed at including a full diversity of women for each stage of policy and program development. Lacey et al go on to demonstrate that an intersectional lens – one which takes account of the myriad ways women are marginalized, recognizes the differences among women, and considers the multiple identities that shape women’s experiences of city life (p. 155) and which is taken up by the Ottawa example – has greater potential to meet the needs of a greater diversity of stakeholders in the development of an inclusive urban environment. They describe Equality Impact Assessments and participatory budgets, two tools that we will discuss in class, as intermediate steps, part-way between gender mainstreaming and an intersectional approach. Finally, the readings from the Kilden web magazine (which disseminates mainstream accounts of gender research and is funded by the Research Council of Norway) provide us with two examples of structural and practical barriers facing NGOs and government agencies that work toward more inclusive futures. Thun’s research tells a familiar story about how “majority” and “minority” NGOs relate to one another, but adds a significant element to the story by illustrating how these relationships may be institutionalized through the funding mechanisms that keep these agencies afloat. Yet, Thun’s research also performs (and may perpetuate) a particular narrative about NGO relationships, which has its own implications. I’ll speak more to this point in class. Kennedy-Macfoy’s research is similarly situated in matters of funding: she asks how state funding determines the priorities of NGOs, and how this translates into reifying existing attitudes (her example is about exacerbating problematic attitudes about immigrant “cultures”). The downside of state support is an unintended consequence that distinctly informs the shape that activism takes. Gender mainstreaming as described by Alston seems to have an active role in Australian policy but can also be seen as gender blindness. How does this relate to other countries’ policies? And do you believe that gender mainstreaming in policies can be effective if done correctly? It has been almost twenty years since the 1995 Beijing world women’s conference and the widespread adoption of gender mainstreaming policy in the EU, Australia, and Canada. How effective do you think gender mainstreaming has been in transforming gender-biased policies and programmes? If there are limitations, how might it be improved? In Alston’s article it is reiterated that gender mainstreaming includes both men AND womens concerns and experiences. She compares how women-focused policies are less efficient than gender mainstreaming as it “only enable women to operate in a masculine defined cultures, attending to agendas shaped by, and focused on, male concerns where the leaning, processes and culture treat women as subordinate.” My question focuses on the confusion of how would it be possible to to achieve gender equality in political, economic and societal sphere, without very specific “female” centred policies at the heart? Could it be possible and more useful by only looking at “gender” as a whole? Alston (2009) talks about the article as exposing gender mainstreaming as an ’empty signifier’ that is contextually grounded, and mentions that its success is highly dependent on making these issues transparent (p. 139). Can anybody explain what this means? I’ve read the article but I am still not sure. In Madeleine Kennedy-Macfoy article the downside of state support. She mentioned problems of which minority women’s organizations are facing in three European countries where she did her research study. According to her “they say that their hands are tied behind their back due to lack of funding”; she stresses a lack of alternative measures to free their hands. After reading this article and from your perspective, what do you think could be better alternative for these minority organizations? For what reason is state funding not available to be equally distributed to both minority and majority feminist organizations to eliminate the problem of majority/minority issues being under looked (due to the fact that they do not have enough funds to get a certain issue across/solved); and is this done consciously by the state?